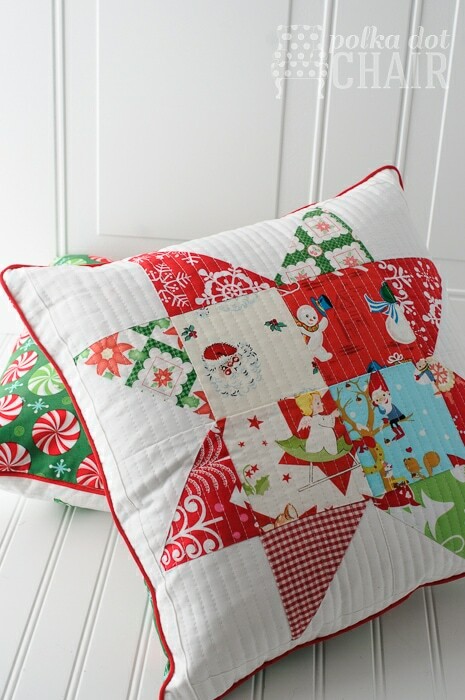 Today I’m sharing with you a free quilting tutorial for these Patchwork Quilted Christmas Pillows made from Christmas Fabric. 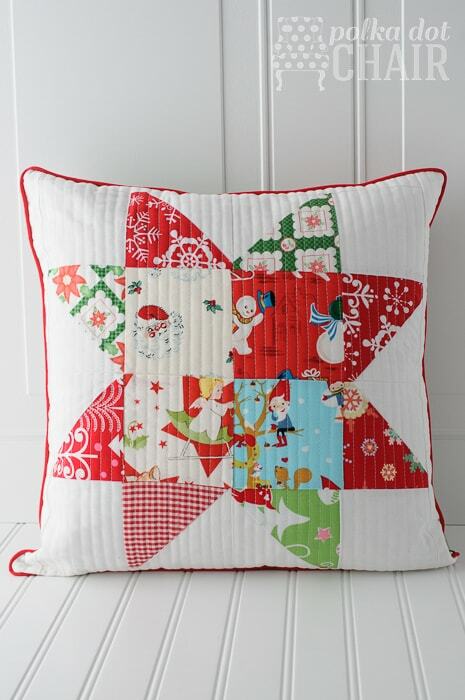 If you like this project you may also love this Log Cabin Quilted Pillow Tutorial. What? 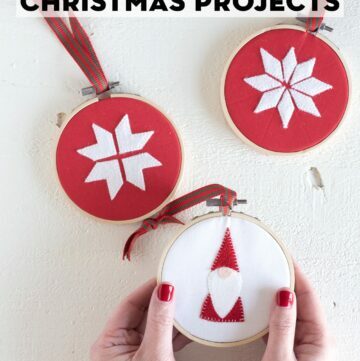 Doesn’t everyone post Christmas projects in February? Sorry to throw you for a loop there *wink*. This project was the victim of the great technology meltdown of December 2013. I never got it posted before Christmas because it was finished right when my laptop died. I can’t bear the thought of sitting on it for a year and not sharing it. 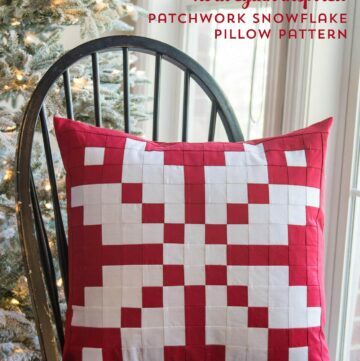 I do love the pattern and the idea behind the pillow! 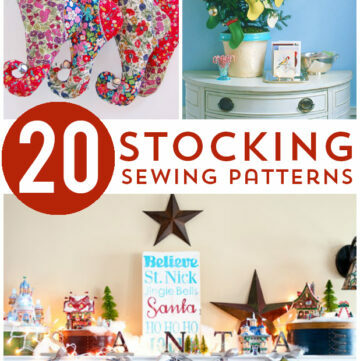 You can just swap out the fabrics for any holiday or occasion. Go, fast, make one for Valentine’s Day! This is an 18” pillow as are my Ghastlie Halloween Pillows. The idea being that I could buy one 18” pillow form then switch off the cover depending on the holiday or season. I can see this same pattern in bright colors for summer or in warm tones for fall. I made a bunch of these last Christmas for close friends and family members. Most of the fabrics came from a quilt pack that I bought from Amy Smart. I never got around to making the quilt so instead used the squares for these pillows. 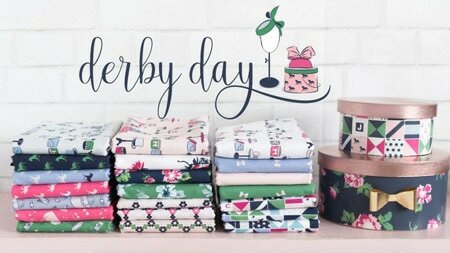 I love to collect Holiday fabrics. When I see ones that I love, I pick them up and save them for my stash. I don’t worry too much about what specific purpose I’ll use the fabric for, but I always seem to find a use. Last fall I made a Halloween quilt with some of my collection of Halloween fabrics. These pillows have piping around the edge to finish them off and a simple zipper closure in the back. 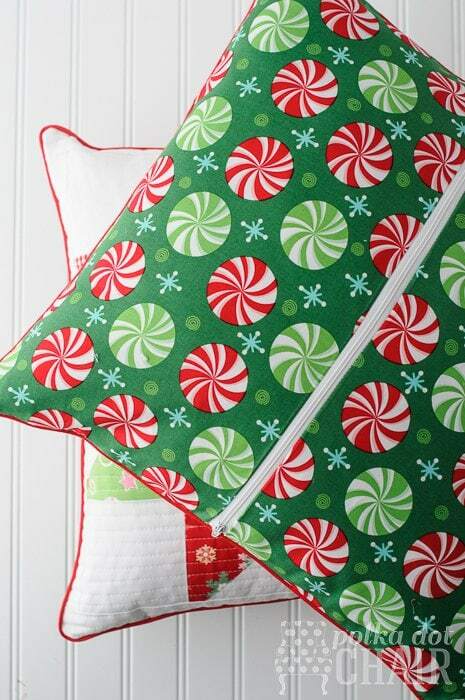 If you’d like to learn how to make the zipper closure, you can see instructions on my Dorm Room Pillow on WeAllSew.com. Here’s a breakdown of the construction of the pillow if you’d like to make one yourself. Remember when you make a HST (a half square triangle) that you lose an 1” in the process (i.e. a 5” square will yield a 4” finished HST after trimming). 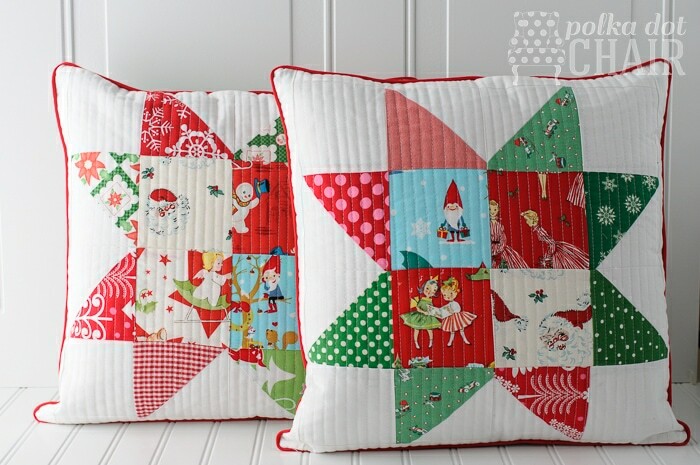 Just a note, I don’t have repeats of my HST blocks on these pillows because I made several and mixed them up with each other. The HST method will yield 2 identical HST’s, so just know if you don’t want 2 of the same HST on your pillow, you’ll need to make more HST’s. 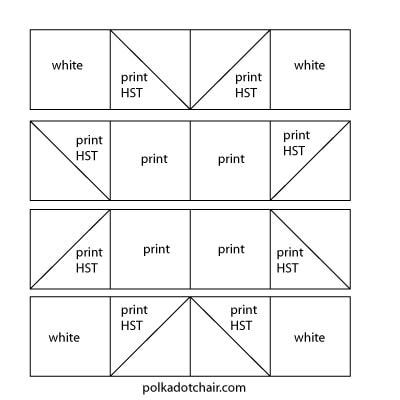 Use your 5” white squares and 5” printed fabric squares to make 8 HST pieces. 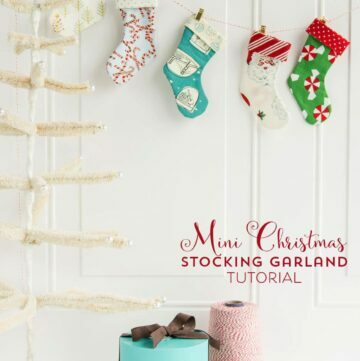 Use this tutorial if you need to know how to do this. Square up your block. Then sew the borders to the block, first to the top and bottom, then to the two sides. Trim to 18 1/2” x 18 1/2”. 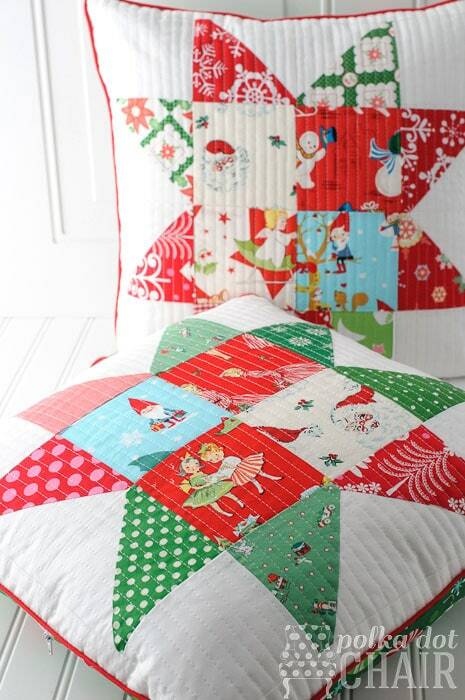 Quilt as desired (you can use this tutorial for help if you need it). 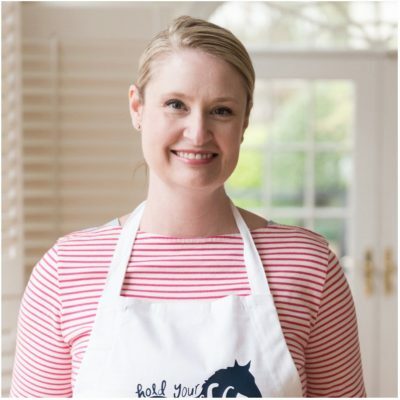 What is piping? The thing you did with the red around the pillow. How did you do that? 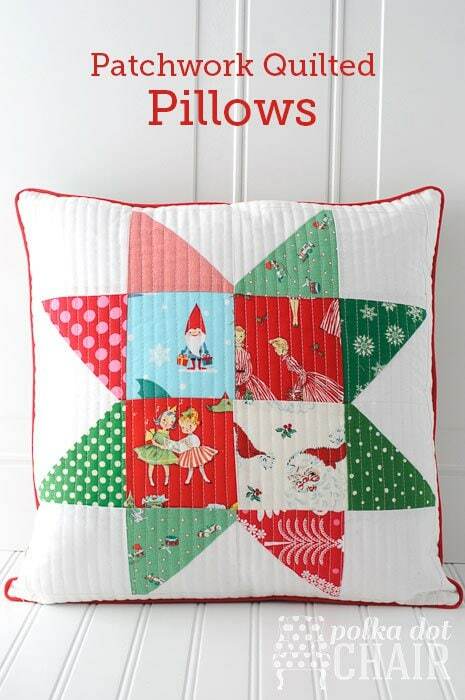 Do you have any leftover fabric from these pillow that you could sell me? 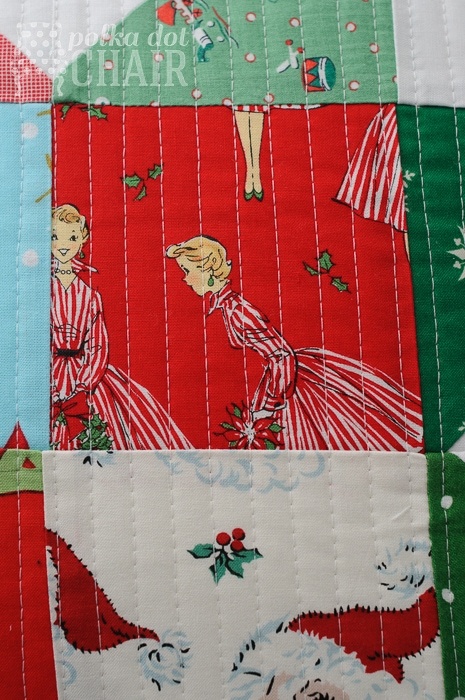 I’m particularly interested in the vintage children pattern with red backround with the little girls holding hands. No I’m sorry I don’t. I just grab them when I see ones I like. I’ve been collecting them for a while now. Loved this pattern and used it again – this time in a table runner. 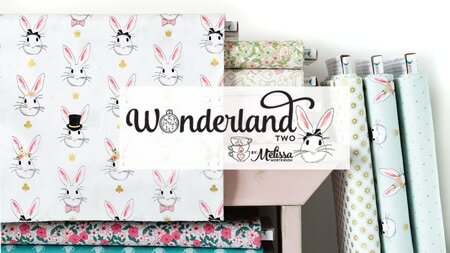 I linked back to your post and gave you design credit! 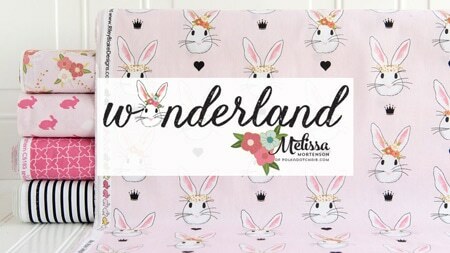 Thanks Melissa for a fun, easy pattern and tutorial. I’m confused….if you lose an inch doing the HSTs, then shouldn’t the measurement for the fabrics be 5.5 inches, so they match up next to the 4.5 inch squares (after they lose an inch)? The five inch squares you said to cut for the HSTs became 4 inches and consequently don’t line up with the 4.5 inch squares. Am i missing something? You lose 1/2 when making a HST, not 1″. 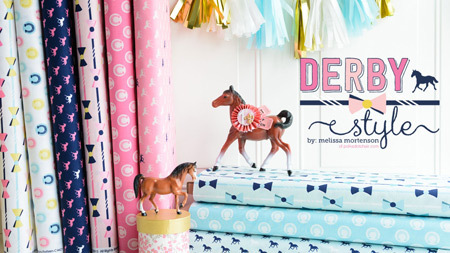 They are 4″ FINISHED and 4 1/2″ before you sew them together.